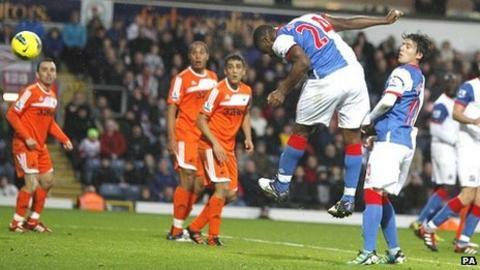 Yakubu scored four times to lift the pressure on boss Steve Kean as Blackburn claimed their second league win of the season by edging past Swansea. Having not secured victory since beating Arsenal in September and with fellow strugglers Wigan and Bolton both losing, Blackburn moved off the bottom of the Premier League after a week which threatened Kean's position. But following the midweek defeat at Cardiff in the Carling Cup, Yakubu proved his value with a poacher's quadruple to give Rovers' fans something positive to shout about - although there were still protests against Kean's tenure from sections of the home support. The Nigerian striker played a delightful one-two with Gael Givet to open the scoring and scored another with his head on the stroke of half-time following Leroy Lita's headed equaliser. The former Everton forward nodded in at the back post following a Rovers corner to complete his hat-trick and make it 3-1. And although Luke Moore brought the nerves back to Ewood Park with a close-range finish after the hour, Yakubu sealed the points from the penalty spot late on following Joe Allen's red card for a second booking. However, with victory sealed, the home supporters again concentrated their chants towards their beleaguered boss, with around 200 staying behind to register their disapproval in an organised protest. It was Kean's seventh Premier League victory in 35 outings, and Rovers remain in the league's bottom three. In a fluctuating match, frustration threatened to be directed towards the team as well as the manager, such was Swansea's dominance up until Yakubu's opener on 20 minutes. The visitors were the far more brighter side, with Mark Gower and Joe Allen pulling the strings in midfield and Scott Sinclair dangerous on the left flank. In contrast, Rovers were ponderous in attack and offered little pace to their ventures when they did get the ball. Sinclair shot wide early on as Rovers fans began to voice their frustration, but the mood was sweetened when Yakubu's goal came from an isolated foray into Swansea territory. The Swansea defence looked to have recovered when Yakubu received the ball up front, but he waited for Givet to overlap and then smacked the Frenchman's cutback into the top corner. Brendan Rodgers' side had a right to feel hard done by, but for all their craft they proved after the half hour that they can also add end product, with Gower exchanging passes before crossing for Lita to nod in at the far post. Rovers were most threatening from set-pieces when Junior Hoilett, who returned to the side following a virus, fired over. Yakubu then grabbed his second, when from Morten Gamst Pedersen's deep corner, substitute Simon Vukcevic - on for the injured Ruben Rochina - volleyed back into the box, and the Nigerian headed in at the back post. And it was from another corner that Yakubu claimed his hat-trick goal on 57 minutes, when this time Chris Samba headed back for the striker to pounce. Perhaps indicative of their lowly position, Rovers could not prevent Swansea from striking back soon after, just when they needed to grab hold of the ball and calm the game down. The visitors' substitutes were the architects as Wayne Routledge's shot from the right was palmed away by Paul Robinson and Moore was on hand to crash the ball into the back of the net. Sinclair, who was a menace down the left all afternoon, fired over from the edge of the box with 15 minutes left as nerves started to fray for Blackburn. The home supporters breathed a sigh of relief though when Swansea were reduced to 10 men, Allen receiving his second booking for a push on Hoilett. And when Vukcevic was brought down for a penalty, there was little doubt that Yakubu would have the final say on the pitch as he tucked in from 12 yards. Unfortunately for Kean, a section of Rovers supporters stayed behind after the game to usurp that. Next stop for Rovers is Sunderland next Sunday, who will be managed by new boss Martin O'Neill. "It wasn't a great afternoon defensively and that's disappointing because for a large part of the game we looked terrific going forward. "We conceded before half-time which was very disappointing, and then another for 3-1 which from time to time we're going to do, but it doesn't make it any easier to accept. "It was a very frustrating day because for large parts of the game we were in total control. It wasn't just possession, it was penetration too, but we needed to defend better."